Sundays are the day I usually splurge on dessert. Not on eating the calories (gleefully I splurge on calories every day!) but on making something more out of the ordinary than chocolate chip cookies, which usually fill up our dessert quota for the weekdays. This dessert was perfect for a Sunday evening meal. It was heavenly, in fact. Silky, creamy (homemade!) 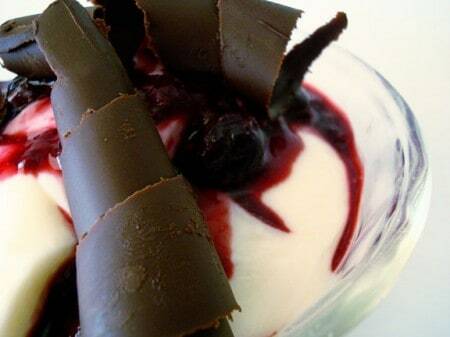 cream pudding is topped with berries and shaved chocolate curls. It was an unexpectedly delicious combination. Again from my Aunt Marilyn, this phenomenal, crowd-pleasing dessert can be made the night before and is the perfect ending to a lovely meal. It is all at once light, smooth, decadent and ultimately satisfying. My husband and I agreed that this dessert tops any pudding or yogurt we’ve ever had in taste, texture and creaminess. And my kids? They were in heaven, too (with very messy faces, I might add). Simmer the 3 cups cream and 1 1/2 cups sugar, stirring constantly to avoid scorching, until it comes to a boil. Set aside and cool completely. Dissolve unflavored gelatin in the 1 cup boiling water and set aside to cool completely. In a small bowl, whisk together the sour cream and vanilla until smooth. 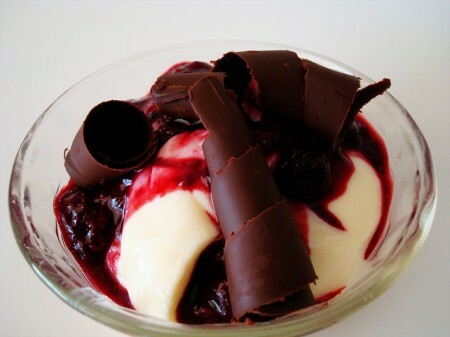 Top with fresh or frozen berries* and shaved chocolate curls. I used Pioneer Woman’s tip on chocolate curls and couldn’t believe how gourmet I felt when they turned out. I used frozen raspberries. I thawed them overnight, then simmered the berries and their juice in a small saucepan with 2 teaspoons sugar until thickened (about 6-8 minutes). The best crème brulee’ I have ever had was at Ruth’s Chris restaurant. This is equally as good and I didn’t have to go through the crusty sugar top, which I don’t care for. I love it with the simple fruit on top. Thank you so much I will be a hit with my married children. My daughter is doing this for a school project and putting them in small containers to sample. We need to do make them a few days ahead. Does it form a skin on top or does the liquid start to separate at all like homemade pudding? If so, do you think putting a raspberry sauce on top would help? Yes, they do form a bit of a skin – so you’d either need to put plastic wrap on top of each one, directly on the surface, but if that’s too much work for a bunch of small containers, a sauce like you mentioned would work great, I think. Good luck to your daughter! I want to make this tomorrow but I’m not finding plain gelatin. Can I substitute with Vanilla Jell-o (with pudding in the mix)? I’m sorry, I’ve never tried that substitution so I’m not sure. I think it would make it overly sweet, though. So very delicious! I made this recipe for Father’s Day and husband is still longingly speaking of how good was ths dessert. Thanks, Mel! 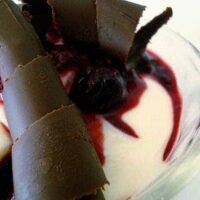 I was checking to see if you had a panna cotta recipe…this is pretty similar and heavenly! I like to make a buttermilk panna cotta and spoon preserves over it too. Another great recipe, thanks Mel! I love your site, and use your fabulous recipes all of the time. Thanks! My gelatin/water mixture turned into a thick jello consistancy when I allowed it to “cool completely”. Thus, when I mixed everything together my end result was slightly lumpy (tapioca like texture). Did I let the gelatin mixture cool too long? It still tasted heavenly….but for future reference, I’d like to know how I could improve. Thanks! Stacy – thanks for checking back in to let me know that you liked this! I would have to agree with your husband. This is such a delicious elegant dessert and I’m glad it was a hit! We tried this this weekend and loved it! My husband said it was his favorite dessert ever! We also had family over tonight and served them some of the leftovers and they loved it. Thanks so much for such a great recipe! Katee – I have been dying for someone to post that they have actually tried this recipe – you are the first! Thank you! I am so, so glad it was a hit, and seriously, if it helps you achieve supermom status, then that is a raving success! I made this dessert yesterday and it was decided it’s the best dessert I have ever made for my family. My youngest (3 yrs old) said, “I was the best mommy ever!” Thanks for the recipe. I hope others who try it get the same results I did. NOW I AM SUPERMOM! I love your blog and your Aunt Marilyn’s recipes! Do you think I could use this pudding in a trifle? oh deliciousness. oh heavenly deliciousness. This will be made before Sunday…oh yes it will. Oh, yummy!! And thanks for the link to the curl instructions. I’ll have to give that a try–along with this. Stephanie – yes, I believe this cream pudding would be delicious in a trifle. Just be sure to let it set up well enough before layering with other ingredients. This looks amazing, I will have to try it in the next week or two!! Yum!!! I love your blog! I drool just looking at it. I also love your Aunt Marilyn’s recipes. Thanks! Yummm….so rich and suave I think. Sounds elegant! Your chocolate curls are PERFECT and I’m not even a chocolate fan! I can’t wait to try this. In other news…I’ve already made THE cornbread twice. Divine. I wish I was one of you children…you eat so well!! Looks delish! BTW, I submitted this recipe in the PW contest…maybe we’ll win! 🙂 Love reading your site! Thanks for the recipes! Jan – hey, thanks for submitting this recipe! That would be unbelievable if you won…I’m crossing my fingers for you. Love the presentation of this dessert! Can’t wait to serve these up! Looks sooooo yummy!!!! Can’t wait to try this one!